The dedicated staff at the National Cancer Benefits Center (NCBC) has been helping individuals collect compensation for cancer caused by government-created radiation since 1995. Compensation funds have been made available by the United States Congress for Americans who were exposed to certain instances of radiation. There are a number of programs that allow for compensation – and each program has its own set of qualifying criteria, claim requirements, and range of compensation allowed. We understand how difficult it can be to wade through and comply with the vast, strict requirements and pertinent regulations to complete the claims process with the best possible outcome. That’s where we come in. Because we have spent more than 25 years helping people just like you, we are uniquely positioned to most efficiently help you get the compensation you’re entitled to. Our claims success rate is better than 90 percent, and our reward is satisfied clients. At the National Cancer Benefits Center, our goal is to guide you through the entire claims process, and we’ll shoulder the bulk of the work so that it is as easy and stress-free as possible for you – ensuring you get as much money as you are entitled to, and quickly. 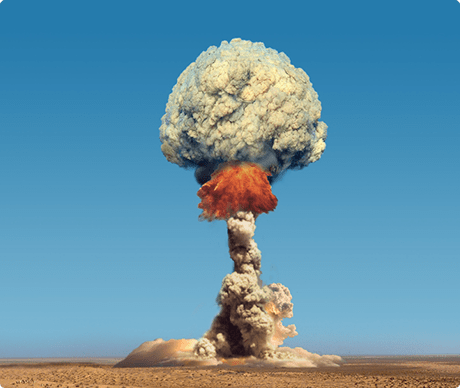 Between the 1940s and 1960s, the U.S. nuclear weapons program was in full swing. Program efforts included a series of aboveground nuclear tests in southern Nevada (commonly known as the Nevada test site) as well as island test sites in the Atlantic and Pacific as well as underground nuclear testing, in addition to uranium mining and processing operations that produced fuel for nuclear warheads. The U.S. Atomic Energy Commission oversaw the program. Decades later, U.S. lawmakers sought to address the needs of those exposed to radiation due to program activities. In 1990, a program was established to provide financial compensation for eligible individuals who became seriously ill as a result of atmospheric nuclear testing conducted by the U.S. or from employment in the uranium industry during the Cold War. Since then, regulations surrounding compensation claims have been updated and revised multiple times – including an amendment that expands coverage to include uranium mill workers and transporters of ore, expand the “downwinder” geographic area, lower the radiation threshold for miners, and remove certain lifestyle restrictions – in addition to a program compensating Department of Energy workers and their contractors and subcontractors who have had cancer and who worked at one of its 380 facilities in 38 states. Disbursements are one-time, fixed payments. As of the end of 2018, the compensation program had paid a total of 35,244 claims, totaling $2,295,823,171. Possible eligible claimants include individuals from many Native American tribes; people who lived downwind from the Nevada test site (Downwinders®); Atomic Veterans®; on-site participants, both civilians and military personnel (Nevada Test Site Workers); uranium industry miners, millers, and transporters (Uranium Workers); and Dept. of Energy Workers. Spouses, children, and grandchildren of claimants are considered eligible survivors, and they may file a claim on behalf of a deceased family member. Radiation containing enough energy to damage DNA and cause cancer is called ionizing radiation. This type of radiation may be released in nuclear power plant accidents and during the production, testing, or use of atomic weapons. Evidence that ionizing radiation causes cancer comes from studies of atomic bomb survivors and from workers employed in certain occupations (such as uranium miners, for example). Any part of the body can be affected by ionizing radiation. These days, concerns about this type of radiation exposure extend beyond the health risk to the person exposed to include its impact on children, grandchildren, and spouses. Current and future studies may help link certain congenital conditions and health risks like cancer back to the parent or grandparent who was originally exposed to the radiation. In addition to acting as a lifeline for individuals seeking general information or help with a compensation claim, our team at NCBC spends a portion of our time and budget educating the general public and the medical and legal communities about the availability and benefits of these government-sponsored cancer compensation programs. Cancer continues to be one of the leading causes of death in the nation. No matter where we live or what we do for a living, it is estimated that one out of every three of us will be diagnosed with some type of cancer in our lifetimes. Our team at the National Cancer Benefits Center supports cancer research programs that are helping to bring an end to this all-to-familiar disease. Early detection remains the best chance of surviving cancer; if you are at risk for cancer, be sure to receive regular screenings by your doctor. Do you know someone who may have a claim for compensation due to cancer caused by government-created radiation? Tell them about National Cancer Benefits Center. We are happy to answer any questions about the process. Call us at (800) 414-4328 today – operators are available 24/7 to take your call – or use our convenient form to request more information.